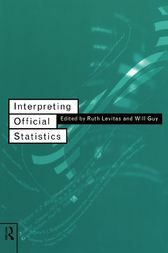 Interpreting Official Statistics examines the official statistics produced about the current state of British society. It documents some of the ways in which information has been suppressed, manipulated and misinterpreted since 1979. This invaluable guide is designed to help students know what figures are available, and to discover when and how politicians are misusing statistics.